If you’ve ever tried to swim in an inflated lifejacket, you’ll know what it means to go nowhere fast. The typical USCG-approved PFD is designed to keep you afloat, not help you perfect your backstroke. One time, a gent called Troy Faletra found that out the hard way when his boat sank 9 miles offshore. By the time he’d reached land 16 grueling hours later, Troy had a sound idea of what his ideal buoyancy aid would look like—an inflatable raft, on which a swimmer could rest his chest while paddling with his legs and arms. Enter the Throwraft TF2401, a compact, automatically-inflated device with 20lb of buoyancy. 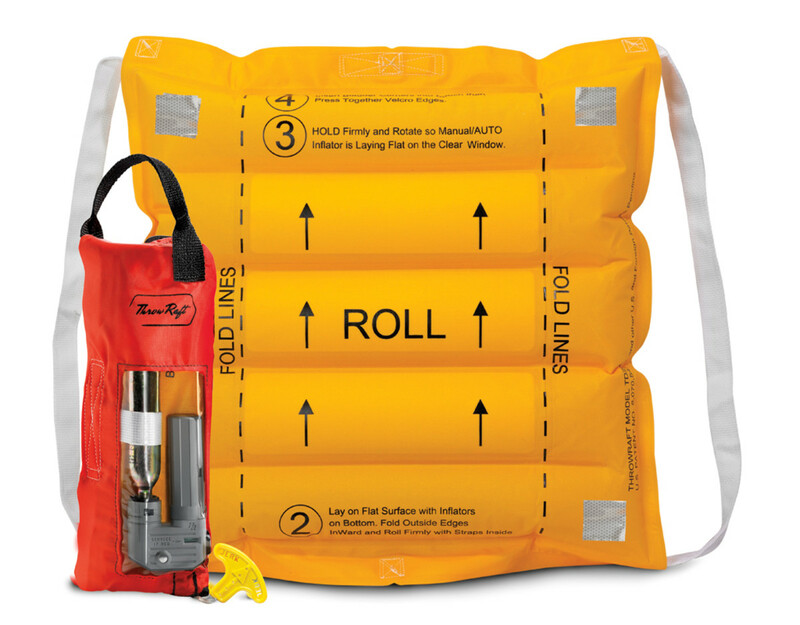 Packed, the raft measures just 11in x 4in; inflated, it’s a healthy 22in x 21in, with loops for your arms. Note, though, that it is not meant to replace a lifejacket—it is a throwable buoyancy aid.